Surf Bikini Retreat is an all-inclusive boutique surf camp exclusively for girls, located in Nosara, Costa Rica. In this unique retreat, as you are having fun learning to surf at Playa Guiones, you will also be having a blast learning and experiencing the Tico surfers lifestyle. 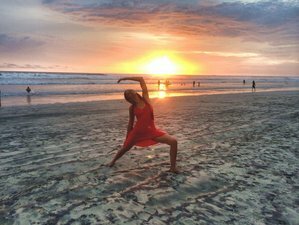 When not surfing you will be learning to prepare typical dishes, dance local dances, learn the local language, or just kick back at the retreat and relax with a yoga class while being surrounded by our mind-blowing panoramic jungle views. Spend your holiday in Nosara and learn to surf and experience the beauty of Costa Rica. Surf Bikini Retreat is comprised of 4 cabinas and a beautiful Costa Rican tipico rancho, the facilities were designed utilizing the finest native woods of the Guanacaste region which creates true rustico fino design. You may choose to stay in a double occupancy cabina (either you bring a friend or you'll be paired with a roommate) or in a single occupancy cabin. All cabinas contain air-conditioned private baths with towels and linens. The surfers rancho as we call it, connects to the pool where you may want to use the WiFi, have a massage, or attend a morning yoga class and take in the breathtaking panoramic mountain jungle views. If chances are good, you will be waking up to the sound of howler monkeys playing in the trees outside your cabina or hear the unique sounds of the chachalaca birds on the mountainside. During your stay youll be provided with full-board meals (breakfast, lunch, dinner) - 100% natural healthy selections from the abundance of local fresh fruits, vegetables, fish, and farm produce. 1 tour of your choice: horseback riding / zip-line canopy tour. The selected tour will be scheduled for Wednesday afternoon, horseback riding for sunset. Learn to cook typical "Tico" dishes such as Gallo Pinto, Arroz con Pollo, Tortillas de Maiz, Patacones, and Chimichurri. Surf Bikini Retreat is an all-inclusive Boutique Surf Camp exclusively for women in Nosara, Costa Rica. This vacation is available from November to August with arrival on Sunday and departure on Saturday.